Sam Thompson and Pete Wicks have stripped down to their dressing gowns for a new shoot [new! 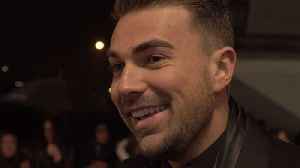 magazine] Pete Wicks and Sam Thompson might just be the hottest new bromance on the block, if these latest..
Olivia Attwood has joined the cast of TOWIE [Splash News] Olivia Attwood has joined The Only Way Is Essex cast after growing close to cast member Chloe Sims. The 26 year old was approached by ITV..
▶ Videos for "Celebs Go Dating"
Nadia Essex is in talks to join Strictly Come Dancing [Brett D. Cove/SplashNews.com] Former Celebs Go Dating star Nadia Essex is being lined up to join Strictly Come Dancing, an insider has told OK!.. Montana Brown has shared her eulogy from Mike Thalassitis' funeral [Splash ] Love Island's Montana Brown has shared her emotional eulogy from Mike Thalassitis’ funeral after making a speech in..
Nadia Essex has paid a heartbreaking tribute to Mike Thalassitis following his funeral [Nadia Essex/Instagram] Nadia Essex has shared a heartbreaking tribute to Mike Thalassitis after attending the..
Megan Barton Hanson is reportedly in talks for Celebs Go Dating[Summer Dyason/ Instagram] Love Island's Megan Barton Hanson could be one of the stars on the next series of E4’s Celebs Go Dating,..
Jack Fincham confirmed he's not dating his Celebs Go Dating love interest Kate [Getty ] Love Island's Jack Fowler has confirmed he’s single and no longer with his Celebs Go Dating love interest,..
*Kerry wants to take a leaf out of TV presenter Lorraine Kelly's book...* This week’s guest columnist, Kerry Katona fills us in on returning to boot camp, her Celebs Go Dating stint, and what..
One of the Celebs Go Dating stars has confirmed their relationship is over [E4] One week on from the Celebs Go Dating final, it’s not been made clear which couples have stayed together. 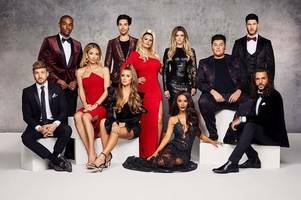 However, one..
Anna Williamson has revealed that the Celebs Go Dating wrap party will go ahead [E4] Anna Williamson has confirmed that the Celebs Go Dating end of series party will still take place. The 37 year..
Nadia Essex has quit Twitter after being trolled [Photo by Mike Marsland/WireImage] Lady Nadia Essex was left devastated and shocked when her good friend Mike Thalassitis was found dead earlier this..
Celebs Go Dating cancelled their wrap party following the tragic death of Mike Thalassitis [E4] Celebs Go Dating bosses have reportedly cancelled the wrap party for the show following the tragic..
Georgia Steel lives in a stunning home in London [Instagram] Love Island star Georgia Steel's career has gone from strength to strength after leaving the ITV2 villa last summer – with her recently..
Mike Thalassitis was set to launch a restaurant in Essex before his tragic death Mike Thalassitis’ fans have launched a campaign to rename his restaurant following his tragic death last week. The..
Kerry Katona has blasted Sarah Harding [Lime Pictures] Kerry Katona has laid into Sarah Harding with a scathing attack on the former pop star. Mum-of-four Kerry has slammed 37 year old Sarah over the..
Chelsee Healey has hit back over her behaviour on Celebs Go Dating [E4] Hollyoaks star Chelsee Healey has broken down in tears while revealing the reason for her "rude" behaviour on Celebs Go..
Jack Fowler hinted he wanted to make it official with Kate in Tenerife [E4] Jack Fowler has revealed to Celebs Go Dating agents Paul Brunson and Anna Williamson that he wants to go official with his.. *LOL! 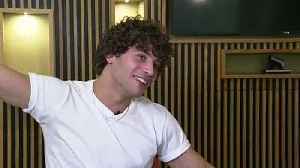 * With Celebs Go Dating drawing to a close tonight, Kerry Katona has given her fans one last laugh over on …Continue reading » The post Kerry Katona leaves fans in stitches as she shares..
Jack Fowler's Celebs Go Dating date called him a "d**khead" [E4] Jack Fowler has whisked Australian waitress Kate off to Tenerife for the Celebs Go Dating final. 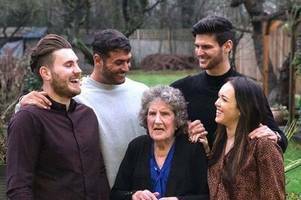 The 23 year old hit it off with Kate..
Sam Thompson's date has been compared to is sister Louise [E4] Celebs Go Dating viewers were left in stitches after voiceover star Rob Beckett compared Sam Thompson's date Aliki to his sister..
Mike Thalassitis was pictured smiling alongside his beloved grandmother in a heartwarming family photo [Nick Thalassitis/Instagram ] Mike Thalassitis was pictured smiling alongside his beloved..